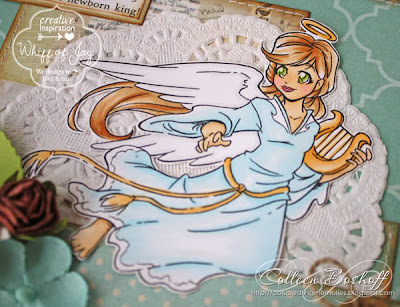 Today I have WOJ's gorgeous new 'Angel with Harp', this is a new release this month. I wanted to create a soft vintage Christmas card with this gorgeous image so I went through my papers and found some My Minds Eye 'All is Bright', inked the edges with Distress Ink 'Vintage Photo' and machine stitched all the edges. Adhered a doily and then finished it off with some Prima and Wild Orchid flowers and a button with some WOJ 'Vintage Linen' Button Twine. The sentiment is WOJ and comes with the 'Angel with Harp' image plus it comes with a second sentiment too! Thank you for stopping by and for your lovely comments, don't forget WOJ's blog hop on the 29th! 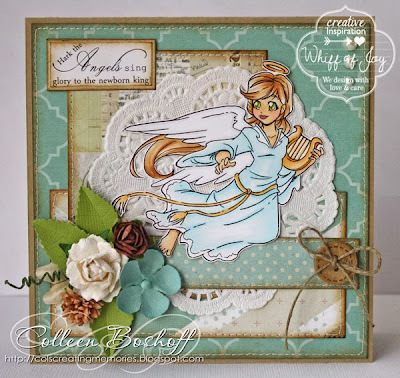 A nice image and the colors...i love this card creation, looks wonderfull! So pretty! I like the soft coloring and your doily background.